V.W.T. Guernsey Wholesale and Distribution | Online Ordering Service. Web design by Bazil. Established in 1978 V.W.T. is the largest confectionery, soft drink and snack wholesaler and distributor in Guernsey. V.W.T. wholesale and distribution service also supply wines, spirits and beers to Guernsey hotels, restaurants and catering establishments. This responsive online ordering site is integrated with VWT (Guernsey) Ltd's order and billing system allowing clients to order online on any device including smart phones at any time 24/7. 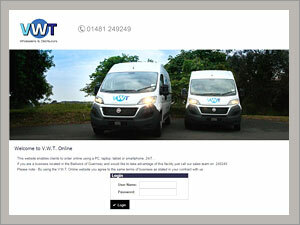 Site designed, hosted and maintained by Web Design by Bazil.